Applications that use SignalR in browsers must use jQuery version 1.6.4 or major later versions (such as 1.7.2, 1.8.2, or 1.9.1). Microsoft Internet Explorer versions 8, 9, 10, and 11. Modern, Desktop, and Mobile versions are supported. Mozilla Firefox: current version - 1, both Windows and Mac versions. Google Chrome: current version - 1, both Windows and Mac versions. Safari: current version - 1, both Mac and iOS versions. Opera: current version - 1, Windows only. Applications using .NET 4 are supported on Windows XP SP3 or later. Applications using .NET Framework 4.5 are supported on Windows Vista or later. Reducing message size. All messaging solution concern size, smaller is better. Use latest SignalR to solved connection increase issue. To fix known knowing issue of early version, suggest to upgrade signalR to latest stable version. *SignalR 2 is only supported on .NET Famework 4.5 or higher version. SignalR web socket issue, caused Network setting limitation. Found SignalR using unsupported transport type and create a lot of connection. 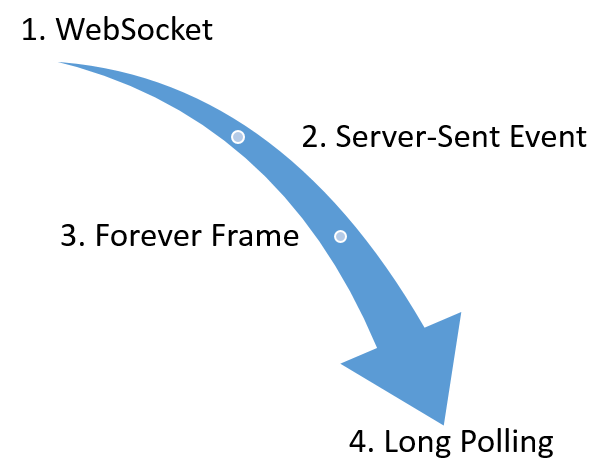 Short-term: To turn off web socket from SignalR, pass the transport type(longPolling, foreverFrame, serverSentEvents, webSocket) you want. Long-term: Using sub-domain and update system architecture to support SignalR with Web Socket Issue. If still have connection issue, review web application design for SignalR scaleout design. Sharing the tuning guide of official post.